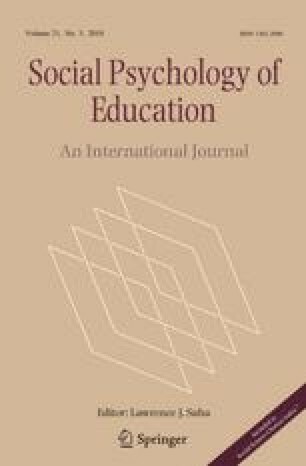 The purpose of this study was to assess the interrelationship of elementary students’ perceived responsibility for learning, self-efficacy, and sources of self-efficacy in mathematics, and differentiation as a function of gender and grade level. Participants in this study included 442 third-, fourth-, and fifth-grade students from U.S. International Baccalaureate schools. Self-report measures were used to assess key study variables. Students in grade five reported higher levels of mathematics self-efficacy and perceived responsibility for learning than those in grade three. Grade four students also reported higher levels of perceived responsibility than grade three students. In addition, regression results revealed that mastery experience, vicarious experience, social persuasion, and physiological state accounted for a significant amount of variance in students’ mathematics self-efficacy, with social persuasion being the strongest predictor. Educational implications for practice within the context of International Baccalaureate schools are discussed. International Baccalaureate Organization. (2005). 2003 United States student survey of high school seniors participating in the International Baccalaureate Program. Retrieved February 01, 2015 from the International Baccalaureate Organization, www.ibo.org/ibna/research/documents/2003StudentSurvey.US.pdf. International Baccalaureate Organization. (2018). Retrieved February 03, 2018 from http://www.ibo.org/. Pajares, F., Johnson, M. J., & Usher, E. L. (2007). Sources of writing self-efficacy beliefs of elementary, middle, and high school students. Research in the Teaching of English, 42, 104–120. http://www.jstor.org/stable/40171749.